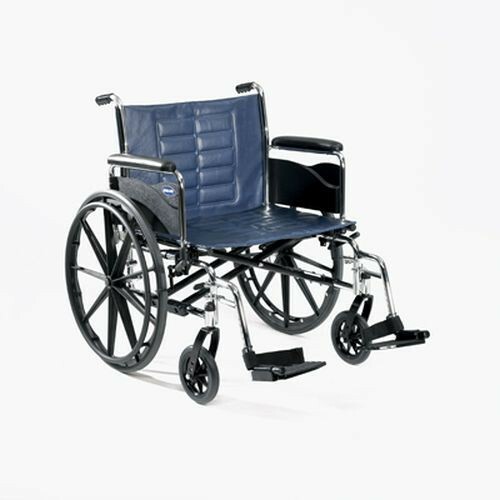 Invacare Tracer IV Wheelchair is a heavy-duty wheelchair with a durable, reinforced frame that can stand up to heavy, active usage. In fact, this is the number one wheelchair used by most airports, malls, and hospitals due to its strength and durability. By combining a reinforced, heavy-duty carbon steel frame, including gusseted sides, caster journals and dual crossbraces, you find the Invacare Tracer IV Wheelchair to be a long-lasting, low-maintenance tank of a wheelchair. The Invacare Tracer IV Wheelchair features a resilient inner-liner to keep the seat and back from stretching during use, while the attractive silver finish offers a pleasing, stylish look. The wheelchair folds to 13 inches wide to allow for ease and convenience with travel and storage. Vitality Medical also carries other items that would pair well with the Invacare Tracer IV Wheelchair, such as Invacare Insignia Wheelchair Accessories and Medi-Pak Slipper Socks. Full-Length or Desk-Length Removable Armrests.